Vote forKalgoorlie, WATop Regional Destinations Which are Australia's must-visit destinations? You help us decide. This historic mining community is an intriguing, modern snapshot of both the present and the past. Once the domain of literal cowboys, Kalgoorlie has grown on the back of the mineral industry and boasts one of the more unique characters of any regional centre in Australia. There are a number of distinct attractions in and around the town unlike anywhere else in the country, and its unique landscape makes for quite a break from your token beach-and-seaside travel destination. The dual towns of Kalgoorlie-Boulder are examples of the past remarkably well-preserved, and despite their isolation are well worth a visit for anyone travelling Western Australia for the first time. Kalgoorlie is both bigger and far more established than most Australian mining communities, with a much stronger and more entrenched community and better infrastructure as a result; along with a wider range of accommodation than one might initially think, the town makes for a much more enjoyable and comfortable stay. Its historic roots are still readily apparent due to its numerous remaining examples of stone-and-brick architecture that have otherwise been knocked down or modified elsewhere in the state, while its colonial pubs with swinging saloon doors carrying with them an aura of the wild west. It's only appropriate, too, given that the town and its mining operations are responsible for roughly 70% of Australia's gold production, and as a result most of the town's major attractions are influenced by mining in one way or another - and are quite fascinating as a whole. Kalgoorlie's most obvious - and physically gigantic - attraction is the Super Pit gold mine; an enormous, deep-cut mine that ranks as Australia's largest and has been in operation since 1989. While technically it's nothing more than a big hole in the ground, it's one spectacular hole at that, serving as a raw example of the power of modern mining technology. Another essential port of call is the town's visitor centre, as unlike other towns and cities that merely serve as information dispensaries, Kalgoorlie's Pure Gold Centre is a gorgeous building in and of itself. Making the trek up to Lake Ballard is also a must-do for visitors to Kalgoorlie, as the work of renowned artist Antony Gormley's ‘Inside Australia' exhibit sits amongst expansive, wide salt flats that stretch as far as the eye can see. Kalgoorlie sits around 7 hours drive from Perth, or can be accessed by the Prospector train for a more leisurely, kick-back-and-relax method of transport. Looking to pay a visit to Kalgoorlie but not sure what to do? Here are some of the most essential experiences. What's new in Kalgoorlie in 2017/2018? The Kalgoorlie Desert Race is set to take place in October and is held over 3 days towards the end of the month to showcase some high octane offroad motorsports. Heartwalk’ is the biggest public art project ever attempted in Kalgoorlie, and it will be back again next year. Visitors and residents can watch as 8 visiting artists create massive wall murals and take the city from dusty mining town to outback metropolis. 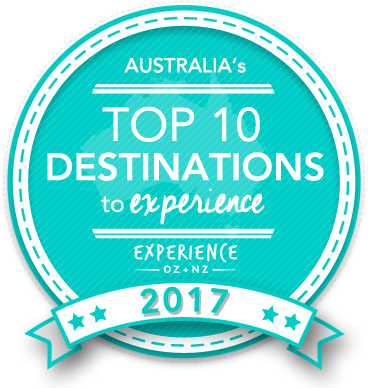 Is Kalgoorlie Australia's Top Regional Destination to Experience for 2017? Vote now for the chance to WIN an epic trip to one of Australia's top destinations!